Another subdued episode to Iron-Blooded Orphans except this time it seemed much more important and ominous or Raise your -Death - Flag! (Thank Koda for that one). In many ways a “A Letter from Tomorrow” feels like a continuation of last weeks “Sakazuki” as we learn more about the Orphans while the relationship with Teiwaz is fleshed out. However unlike last time the episode flowed much more smoothly and seemed to have a purpose and focus that was lacking last week. It all came together making the episode far stronger while still having the same feel. If you want to see my previous entries you can check out Episode 9 here along with the tag. As a continuation from last week very little in the way of direct events happened that deserve much attention, as such this write up will be more opinion then recap. I feel this will allow us to discuss the implications of the episode rather then just rehash the events. Allowing for a more thorough understanding of the episode and where we are in the series proper. If you like this change please let me know in the comments and I’ll perhaps try to change the format up to keep things interesting. Moving on one big event did occur with the introduction of Teiwaz’s business liaison Merribet Stapleton. As Orga quickly understand she represent the fact the Teiwaz bosses don’t fully trust Tekkadon to perform their duties fully. However this might be a little over reading of the situation as its further explained away she represents more their business interests. This seems very sensible as we know quite well with the exception of Biscuit very few Tekkadon crew members have shown any real knowledge of the less martial forms of the organization. Moving on a second major part of the episode was the letters from Mars. However some came from members of the Tekkadons crew’s families. In many way setting up two classifications of crew members those who see Tekkadon as their sole family and therefore attachment and those that do not. Interestingly the two characters focused on with this was Biscuit who’s attachments I have written many times makes me feel he is likely to be killed for great emotional points. Beyond him is Takaki the young blonde who I could also see being killed off quite easily. As he currently really reminds me of Toll from Gundam SEED a relatively pointless but sympathetic character that could also fill the role I assumed was Biscuit’s by right. Beyond them however if the backstory that seems to hold the most promise as being foreshadowing. Akihiro who is now less “suicidal” in his fighting style as Lafter in her one appearance says is revealed to have a younger brother as well, however he was sold to different owners. I feel this is too specific as to not signal something most likely a reunion between brothers. I could of course be thinking to much into things as is often the case. Finally we also learn more about Atra and why the young girl seems so attached to Mika. As she had escaped from what looks like a burlesque house/stripper joint as a child only to be on deaths door due to starvation where she meets a young Mika. Who manages to change her life by getting her a job with a local store that does business with the CGS. Thereby saving her life. For me much like the other flashbacks this is ominous as it once again merely raises the chance of her dying, I personally think it would take a lot for the series to go there. 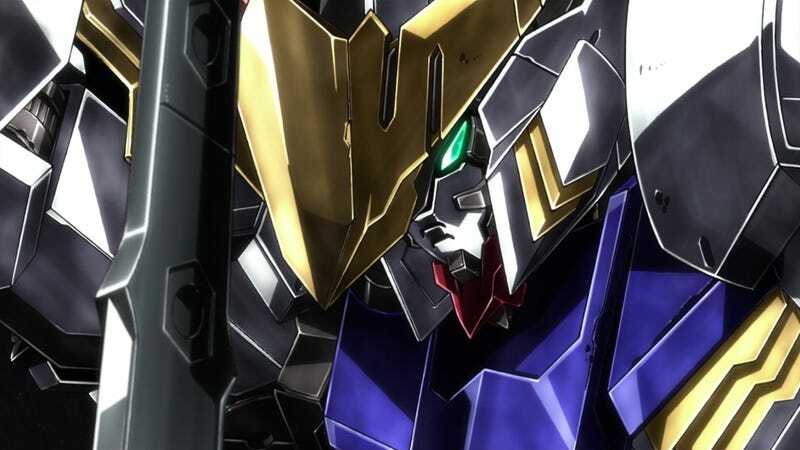 However if there is anyones death but Orga’s who may have a profound effect on Mikazuki it’d be Atra. In the end of the episode we were teased that the action will be starting up in earnest tomorrow. Interestingly of the three named characters in the action two have raised quite a few death flags this episode. All around this was a good episode for raising the dramatic tension going forward but personally I’m happy we’re finally going to see some action. With what looks like new Mobile Suits too! Anyways as always thanks for reading a leave your comments bellow. Also vote for Music of the Week! Gundam Music of the Week: For this week we’re moving to the Universal Century with an entry from Gundam: Unicorn! Merry go Round was one I personally never would have picked (as I didn’t really remember it... I prefered B Bird) but it was requested by BansheeNorn and I want these to be interactive, however we got lucky as this song really does rock, so if you have any Gundam music you like please let me know and lets keep this being awesome.